After missing the cut in his hometown Sony Open in Hawaii, Tadd Fujikawa still has no regrets over his career decision. HONOLULU » He thought he had the game and was determined to play golf for a living, so he turned pro before finishing high school and spent two years traveling the world as he tried to make it to the big leagues. Maybe it will pay off at the Sony Open. 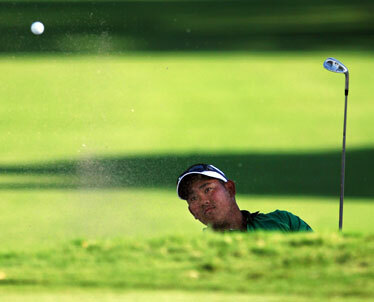 Kevin Na went into the third round yesterday only two shots out of the lead. The other kid taking a similar route is Tadd Fujikawa, who missed the cut for the ninth straight time since turning pro last summer. Fujikawa made history last year at the Sony Open when he was 16 as the youngest player in 50 years to make the cut on the PGA Tour. The encore didn't go according to plan. A year ago, he dropped his putter and raised his arms in triumph after an eagle putt in the second round for a 66. On Friday, he lifted his head to the blue skies over Oahu and closed his eyes as his shots found the rough and his putts caught the lip. He went 74-70 and missed the cut by four shots. Fujikawa has played four times on the PGA Tour, twice on the Nationwide Tour, and once each in Japan, Europe and on the Canadian Tour. He is still waiting to cash his first paycheck. The pressure probably will build. Questions are sure to follow whether Fujikawa, a 5-foot-1 junior in high school with a big heart and impeccable manners, made the right choice by turning pro so early. "I think it was the right decision," he said. "I have no regrets as of right now, and hopefully throughout my golf career." Where that career takes him over the next few years, starting with 2008, is uncertain. His next stop is the AT&T Pebble Beach National Pro-Am, the second of seven exemptions he is allowed on the PGA Tour. His agent, Kevin Bell, has letters out to just about every tournament as he tries to build a schedule. Spots on the Nationwide Tour are hard to find, a circuit filled with players grinding to make the PGA Tour. He received an offer a few weeks ago to play in Abu Dhabi, but had to turn it down because he could not get from Hawaii to the Middle East until the early hours of Wednesday. They are looking at Europe and Japan. The road looks even bumpier because it starts in Honolulu, and that naturally evokes comparisons of another teenager from Hawaii who turned pro as a junior in high school. Michelle Wie is now in a tailspin, brought on by injury and questionable advice. Fujikawa, however, finds inspiration from Na. Born in South Korea, Na moved to southern California when he was 8, picked up the game a few years later and was one of the top juniors when he dropped out of high school and turned pro. He failed at Q-school, then went to the Asian Tour and won the Volvo Masters of Asia, which got him into a World Golf Championship at age 19. He made it through Q-school later that year and has kept his card each year. Na's advice to Fujikawa was to keep playing. "He just needs to play a lot of tournaments, whether that's Nationwide, PGA Tour, any tournament he can play anywhere," Na said. "He's popular, so he can get a lot of sponsor exemptions overseas. I think that's a great place to go, because you get to see the different parts of the world as a young person, and I think that really opens up your mind." Fujikawa comes from a humble background. His father is a self-employed contractor, his mother works part-time at an auto repair shop. He goes to public school, plays on public courses. One reason for turning pro was financial. Fujikawa found it difficult to pay for travel to amateur tournaments, and a few endorsements help with the travel. He has signed deals with Aloha Petroleum, Kraft Foods Hawaii and Hawaii Medical Assurance Association. Most of the deals are tied to appearances in Hawaii, where he enjoys celebrity status. "His parents only want him to get out and play tournaments," Bell said. "They're not looking for $500,000 endorsements. That's not realistic. They want to make sure he likes what he's doing. His goal is to get his tour card when he's 21. If he can do it sooner, even better." Fujikawa had more than one kindred spirit at Waialae. Sean O'Hair comes from an entirely different background. He was groomed to be a star by his father, who enrolled him in the top golf academies, trained his son like he were in boot camp and looked upon him as a business opportunity. O'Hair's father had him turn pro before his senior year in high school, and they traveled the country trying to Monday qualify on the Nationwide Tour, meeting failure at every turn. Only after he broke away from his father and got married did O'Hair figure out a better plan. He played a mini-tour in New England, then the Gateway Tour in the west, returned to New England and made it through Q-school when he was 22. He was the PGA Tour rookie of the year, winning the John Deere Classic and finishing 18th on the money list. O'Hair doesn't know Fujikawa well, but he knows what he's going through. "There's nothing wrong with him struggling," O'Hair said. "If you don't fail, you'll never learn." The career choice was made last summer, and there's no turning back. The only thing Fujikawa can do now is keep playing.